I love this app! The only minor complaint I have is for sorting options. I’d love to be able to sort the titles without using prepositions (it, the, an, etc). Maybe I’m doing something wrong? 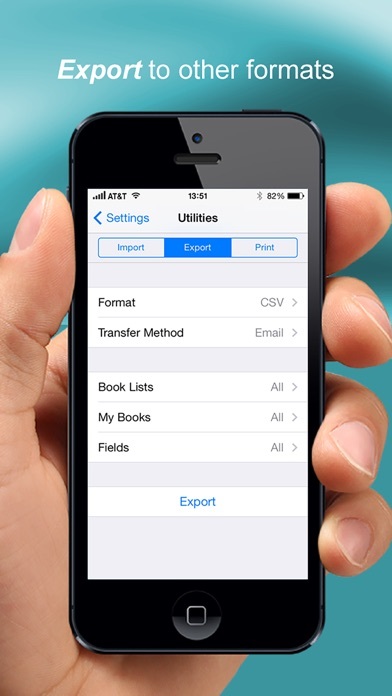 I used this app to input 1,000+ books from my classroom library and I love it! Simple to use! I love my books that I get for free on Amazon. I have one request though. In “reading status” I would like to see another category as “not finished”. As a reminder that I couldn’t read any further. I really like this app it makes organizing my books fun. I absolutely love this app. I have been using a spreadsheet for years and that had its issues. This gives me everything I need! My only wish is that I could sort the wish list by author. When I go to a bookstore books are typically shelves by author and I find it a bit clunky to figure out what books I need. But otherwise this meets all my needs! After scanning a lot of my book collection, I'm still really liking this app. A big problem I had before was no batch editing, but they have added that option now so I'm very happy with that. My main complaint now is that many novellas in my series are half volume numbers, like 2.5, and there is no ability to use a decimal when adding volume numbers, therefore I cannot correctly order a series. I love this app. It was super easy to add my books...even the ones without a bar code. The frustrating thing is the sorting option. The title of the book I get. But by author’s first name?? I have my class library in alphabetical order by author’s last name. . . As do most libraries. It would be great if you could add this feature. Also, it would be great to be able to print a list, not one page per book title. This is an excellent app, well worth the price! I tried multiple apps before deciding on this one. My one request would be for there to be some way to search online for non-physical books (e-books, especially Kindle). Entering my physical library was quick and seamless, but I have to enter each Kindle book manually. Loving it for my collection. My only complaint is trying to get it to recognize older pre 90’s ISBN’s. We have close to 800 books in our library and this is so great...had considered using a spreadsheet or FileMaker...but this...has made my week. I’ve just started using BookBuddy Pro. It is extremely easy to use. I’ve not found any problems that have held me back. I would like to suggest an add by ISBN. But, I love this app. You can backup to the cloud and other places. You can even write it out to a CSV file. Only another 5000 books to go. This app has some nice features, but does not sync between devices as promised. Don’t waste your money. I was pretty excited to find out this app exists because I’ve been longing for a tool to catalog our home library for a long time. We homeschool and have a LOT of books. I’ve already entered over 400 books and it’s been working really well except for one or two little crashes. No huge deal. My friend is also using this app so we can more easily find out what one another has. My one wish is that she and I could access each other’s libraries. This app is nearly perfect in organizing books among my children, students and myself! I love the options of organizing my books into professional, personal, and children categories; I love that I get the option to add more categories or edit the ones already provided. I also LOVE the loaned out option; you can assign a book as loaned out/returned. I would give this app five stars if I could access my library online, but also if the loaned out option would be more streamlined, such as, you could click on "loaned out" and it would automatically assign the current date. It just requires too much clicking to assign a book as "loaned out" and then you have to toggle to the current date. I wish you could just scan or click a book and it would automatically assign it as loaned out and include that day's date, maybe provide a default option in settings? Hopefully, those features will be added later. I plan on keeping this app and hope these changes can be made or that some other developer will include these options. Until then, it's the best library app out there! The best app of its kind! I just used BookBuddy for five minutes and I am in LOVE! It is so easy to use, and you can try it for free up to 50 books. I’ll definitely be going to Pro version when I get to book 51. It’s only five bucks! Plus, I can feel great that all my data will be safely backed up in my Dropbox. I am over the moon! Oh, and EVERYTHING can easily be done from my iPad or iPhone. I am seriously excited over entering just one book in there to try it. What took five minutes was trying to stand still long enough to show my family my new lovely thing! Brings organization to something hard to organize. This app has been useful in organizing my reading collection. I mostly read professional or work-related books and lend to co-workers. I have a collection that’s half on my Kindle and half read books, with about 30% that overlap. I can track who has what, take notes/comments (especially useful for books not on Kindle). Having a better way to add Kindle items would be useful, as well as tracking those items. I’m using the tags feature. There is a format; however, for the 30% overlap, this was not working well. I really enjoy this app. It is truly a great way to organize my home library (I have over 1000) books. The only complaint I have is it doesn’t or I am not sure how to have this available in both my iPad and I phone with all of my book information. The app contains a way to log books with locations and list books in series which I find amazingly useful. 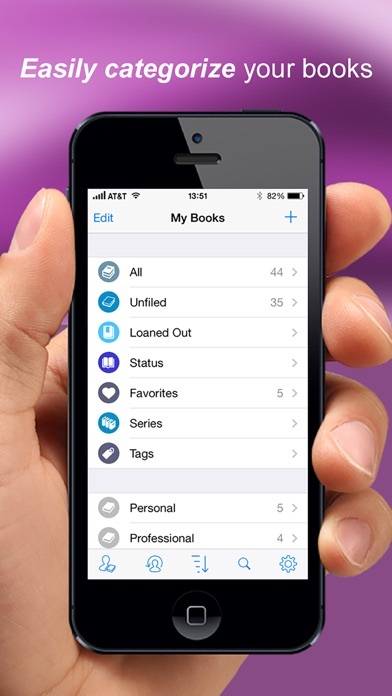 I have purchased other book inventory apps but didn’t use any of them for some reason. I purchased the Book Buddy Movies and Music and love the Book Buddy. Haven’t used the other two yet. A couple of days after I purchased the app, had a question about adding location field; I emailed the web site in the middle of the night and within half an hour or so received a detailed satisfactory answer from them. I am happy with the app and the service. I live in a senior apartment building and am the volunteer librarian. I now have over 2,000 books and have been able to Inventory all of them by area of the library where they can be found. For example, they are divided by large print, paperback, hard back, biographies etc. I couldn’t have done it without this wonderful app. This app fits by needs by far. It can catagorize books by, name, price, publisher, etc. 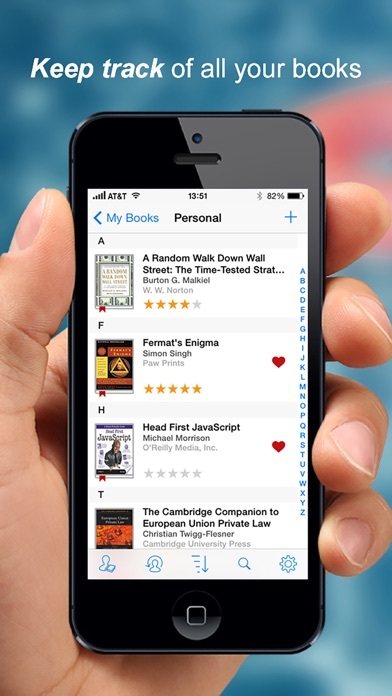 The app gives you unlimited amount of books in you personal library. The best benefit of this app is the barcode scanner. It can always find the name and other information about your book just by scanning the barcode! If your book can't be scanned, they even give you a little internet to search for your book. If it isn't on the internet or it can't scan on the barcode scanner, you can add it manually. I only had to do this once for a local book I bought. As you might see, I did take off a star. I took of this star just because it costs money. I don't think it is necessary to cost money. Newsflash, you're not going to make a lot of money with this app! They even have a free one that I originally had, but it only let you have forty books in your library. Guess what?! They didn't even tell you about the forty books only rule. Consequently, when I had took my time to scan 40 books, it shut me off! Telling me only 40 books! Anyways, that is their problem. The rest of the app was really good, if I could I would give it a four in a half rating. But now I'm happy to give it a 4 out of 5 star rating! I love this app and find it very helpful in keeping track of my reading. I occasionally don’t finish a book and would like to have a Reading Status that indicates Unfinished. Is this possible? Honestly this app is so close to perfect. It has so many important features, a place for dozens of fields, and custom options including notes. But it really needs a way for you to pick a random book from your library. People with large collections need a way to decide what to read next. I have a similar app for my movie collection and it allows you to simply shake your phone to pull up a random movie. I use it constantly. Would love the same feature in bookbuddy+. 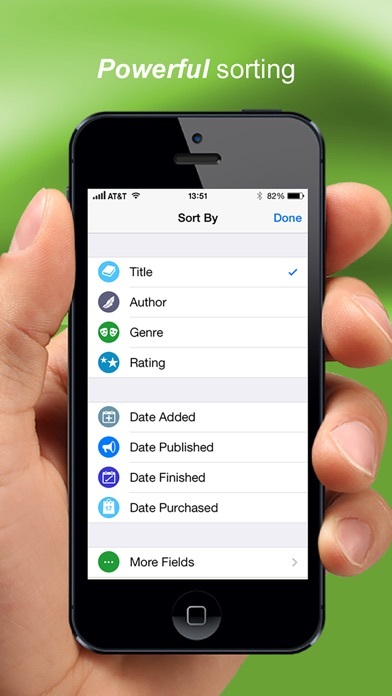 I love the concept of the app, but there are definitely some streamline changes to be made (too many clicks to get to changing the status-reading the book is the only purpose it serves, so it should be as easy tapping a toggle next to the name of the book) & some feature I'd like added. There needs to be a way to put a book in two categories-I'd love to keep my books sorted by genre or author while also having a list of current reads or TBRs. The developers said I should use tags for this but that takes too many clicks and is hard to find too, you can't see how to add a tag to a book without clicking edit first or if you try to add a book to the tag itself, you have to rescan it- you can't just add it from your list of books already in the app. Also, I knocked off a star bc the developers were a condescending I their reply to my previous use, I know how to use the app, thank you very much, I just think it could be streamlined. This app does so much more than what I need, but who knows? Right now I'm just using it for a list of books I want to read - whether I buy them (as e-books, actual books, or audiobooks) or take them out of my local library. I may add to what I do with the app later on, but for now one step at a time. This is a great app. I just bought it and spent 2 hours at my bookstore loading books to my wishlist by scanning the barcode. I would give it 5 stars but as yet I have not been able to sort my series lists by when they came out or in order by how the books fit in the series without scanning them that way. If I could scan them all and the move the book into order then I would give this app 5 stars. A great app. Love it, however, I recently got a iPad and cannot figure how to get the file from my phone to iPad. I tried the backup file, but the app doesn’t recognize the file. Any thoughts? I am so impressed with the support that you receive with this app! I asked a question and very quickly received an answer!!! Love this app!!! Great tool for my classroom library. I just wish there was a way to turn in multiple books at one time (all from one person; mark them all as returned). I love being able to keep track of my books with Book Buddy. Being able to scan my new books into the app using the barcode scanner is great. I just wish that when the books are sorted by author it was by the author’s last name not their first name. I've just started scanning my book collection, but I'm really liking this app. My main complaint so far is that I can't batch edit. For example, after scanning in a bunch of books, I'd like to be able to select multiple ones and add a series title to them. Right now you have to do that one by one, and that's very time consuming. Also many novellas in my series are half volume numbers, like 2.5, and there is no ability to use a decimal when adding volume numbers, therefore I cannot correctly order a series. 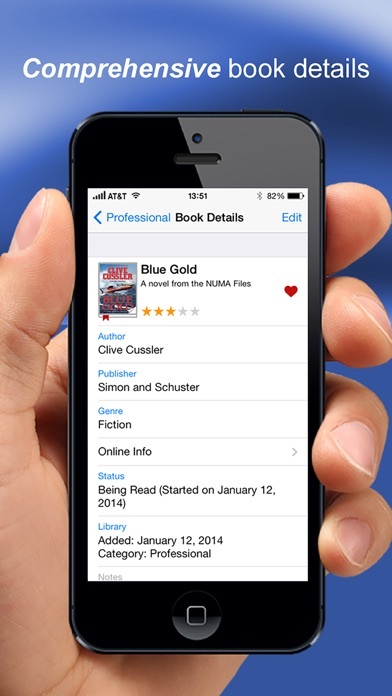 BookBuddy is a perfect app for your mobile device. It is easy to use, offers a wide variety of ways to sort your Library, and best of all, it downloads a summary of every book from online. Thus, you can quickly read a summary of the last book you’ve read in a series before starting the latest release. It even includes a separate wish list where you can keep track of the books you want to read. The companion MovieBuddy app is equally effective at building a library of all the movies you own in whatever format they exist in (VHS, DVD, Blu-ray, Digital, etc). Easy to use. I love having my catalogue of books with me as I shop. In logging them have found multiple copies of multiple titles unintentionally duplicated. This has already helped me avoid additional duplicates. I simply wish I could also sort by genre and author. My library is too extensive to simply search by title or series. The scanning and sorting features are great, but the importing function is flawed to the point of junk. Wasted a lot of time trying to import my existing 1,000+ book library. Por 40 años mi biblioteca fue un desastre. Pero al fin, gracias a esta aplicación logré organizarla. La aplicación es muy fácil y contiene todo lo necesario para organizar nuestra biblioteca. Sinceramente es excelente. I really liked how I could scan all my library and sort them into the bins I keep. I wonder if there is a way to see a list of who checked out the book prior, just to see if the book is damaged who did it and if it is being read at all. Still learning new things on this app but totally worth it. I am finally getting around to categorizing my books. We are a book loving family and between the 10 of us (8 kids and 2 parents) we have acquired a nice sized library. I’m still figuring out how this works, but my main disappointment is that scanning the isbn of a book does not identify if it’s a paperback or hardback. Since all books have a unique isbn for either one, I’m disappointed that it’s not known. Also, it surprises me how many books are not in the system yet and we have to manually add, but maybe this will get remedied over time. Overall, I am happy with the product. a great app, but with so much more potential! A great app! Fairly easy to import new titles. Some suggestions to optimize usability of the bookbuddy (and moviebuddy) app: 1) batch edit function. at present you can only edit items one at a time, field per field. provide for the ability, in list view, to select multiple items; then have the ability to apply an edit, to a single or multiple fields, to all selected items. 2) search query. at present the search function will only search the titles of items. provide a module that allows for a multi-parameter or multi-field search; for example by tag(s), genre, or combination of fields. 3) desktop app, or desktop web browser-based interface. a lightweight desktop app or desktop web browser interface that syncs with your mobile device(s). this would greatly aid in database management, as managing from the mobile device interface is clumsy esp. when needing to edit each record one at a time, field by field. Good, but sharing files between 2 persons (import) too complicated. Do be aware that the scan ability of the app only works for the newer ISBN barcode standard, and books that used the older UPC standard must be entered manually. Given that 95% of the roughly 2000 books in my library date from before 2001, the app is far less valuable to me than I had hoped. However, if your library is mainly new books, the app does work quite well. Nice app, easy to use, especially like the location field. Using it to annotate which box my books are in for a move so I can find them later- will need to be in storage for a few months. I can default the location as I scan the books and sort on it. CAUTION: After multi-scanning 2 dozen books, the "Done" button doesn't work... Had to force quit the app and my work was not saved. It works ok with about 7 books in multiple scan. That said I like that I can use Dropbox to access data from various devices. So far so good. I have over 200 cookbooks and have scanned them successfully and sync'd then to Dropbox, and confirmed the following day that they are still there (they are). But a few weeks later, they're gone. All 200 books. I repeat the process again. Same. Repeat. Same. Sync'd to iCloud the fourth time, no issues. AVOID DROPBOX. Also, why only iCloud or Dropbox offered as a cloud solution? Why not OneDrive (Microsoft)? Just what I was looking for. Keeps track of the books I’m reading and the books I’m going to read. Loaded with customizable settings and lists. Love this app! I got this app a while ago. When I first got it I thought it would be great with a bar code scanner. After manually entering in my library I sent an email to the developer with the thought. They responded and told me it was coming in a future update. Here it is and I love it!!! Great tool to help me keep track of everything and now even easier to use. Thanks. What a wonderful resource for a bibliophile like myself!! I am happily cataloging my extensive personal library. Thank you for such a great app!! I love it. Just purchased. Started adding books right away. The app is easy to use. One of the best I’ve purchased. It’s great for keeping track of books you have and read but I find that book buddy does not “ keep all entries”. I find books that I have scanned in disappear. All in all a very usable app, but with one major failing. I’d still recommend it because the usability of the list is good once books are in but it’s going to take a looooonnng time to catalog my books. Pros: * Super easy to add books which have an ISBN barcode. * Well-organized, easy-to-use UI. * Additional search feature that lets you use the ISBN or title (typed in) to locate unscannable books. Cons: * One major failing - books with the EAN-13 barcode and 10-digit ISBN rather than an ISBN barcode can’t be scanned. Makes it tough to catalog a lot of books quickly. For books with a 10-digit ISBN included above the EAN code or with an easily scannable title, please add an ISBN OCR option and a title OCR option to enhance the search option? (Is there open source OCR you can integrate?) * No sortable publication year field * No sortable publication format field (hardcover, etc) * Would be great if there were a way to import a list of digital books as well, at least from Amazon (but Google Books would also be great) - integrated launch of digital books would be even better!